Diesel gensets have become a major source of power for building modern infrastructures. Further, these are heavily deployed to provide back-up power across various applications. In India, diesel gensets are being utilized in the construction, retail and commercial sectors. Additionally, diesel gensets are also used as prime and standby source of power in industrial sector especially in the manufacturing sector. According to 6Wresearch, India diesel genset market is projected to grow at a CAGR of 4.5% during 2018-23. In India, diesel gensets with rating 5KVA-75KVA accounted for majority of the market share due to ease of availability, low cost and wide range of usage across various applications. The 5KVA-75KVA rating genset market is expected to maintain its market dominance throughout the forecast period. Utilization of these gensets across power telecom infrastructure in unreliable and off-grid areas would drive the market. Amongst all the verticals, commercial vertical accounts for major share in the overall India diesel genset market. Retail, commercial offices, hotels, hospitals and BFSI are the key revenue contributing segments. Further, among all regions, the Southern region accounts for the highest revenue share in FY2017. However, the southern region diesel genset market is expected to witness slowdown due to improved power supply position. Northern region is witnessing increase in demand on account of large scale infrastructure projects such as Delhi metro expansion plan and Lucknow metro. The report thoroughly covers the diesel genset market by KVA ratings, verticals, regions and states. The report provides an unbiased and detailed analysis of the on-going trends, opportunities/high growth areas, market drivers which would help the stakeholders to device and align their market strategies according to the current and future market dynamics. • Historical Data of Global Diesel Genset Market Revenues & Volume for the Period 2012-2017. • Market Size & Forecast of Global Diesel Genset Market Revenues & Volume until 2023. • Historical Data of India Diesel Genset Market Revenues & Volume for the Period 2012-2017. • Market Size & Forecast of India Diesel Genset Market Revenues & Volume until 2023. • Historical Data of India Diesel Genset Market Revenues & Volume by KVA Rating for the Period 2012-2017. 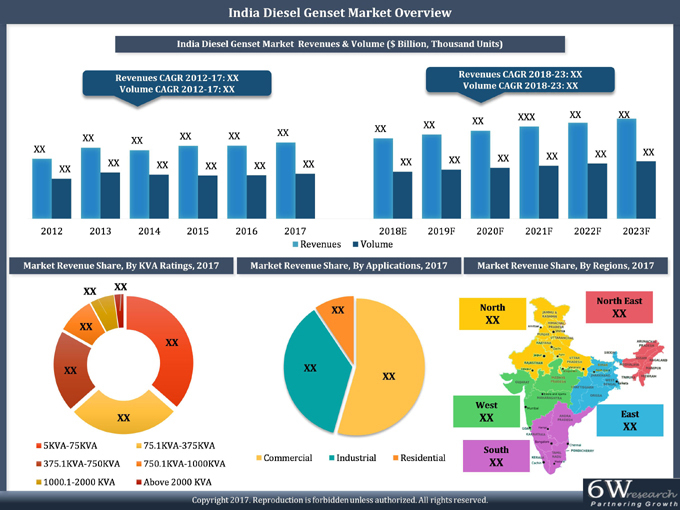 • Market Size & Forecast of India Diesel Genset Market Revenues & Volume by KVA Rating until 2023. • Historical Data of India Diesel Genset Market Revenues & Volume by Verticals for the Period 2012-2017. • Market Size & Forecast of India Diesel Genset Market Revenues & Volume by Verticals until 2023. • Historical Data of India Diesel Genset Market Revenues by Regions for the Period 2012-2017. • Market Drivers and Restraints. • Market Trends and Developments. • India Diesel Genset Distributors, By State. 21.7. Kirloskar Oil Engines Ltd.
21.9. Mahindra & Mahindra Ltd.